Well, we covered curious things here some posts ago, and their not-so-distant cousins raise their heads (well, head) in this one. This particular photo (which I have cropped a good deal to get y’all a little closer, so to speak) reminds me — as the Tolkien-knowledgeable among you may have already picked up on — of the character Gollum. The big fly, of course, was simply eating a meal (the little fly, of course!) when the big mammal with a camera hovered over it (and I (would like to) imagine the dilemma of how to escape without losing its meal was the source of this pseudo-expression). And yet, when I look on it, the photo reminds me of Gollum and his unconquerable desire for a thing that can only corrupt and destroy him. It seems like a good metaphor for the United States of America, in these uncertain times. As a country, I hope we can let go of the precious little things — those ideas, attitudes and insecurities that weigh heavy in our heads but evaporate when released — and hold on to our dinner. It is a time to hunger, because soon it will be a time to eat. 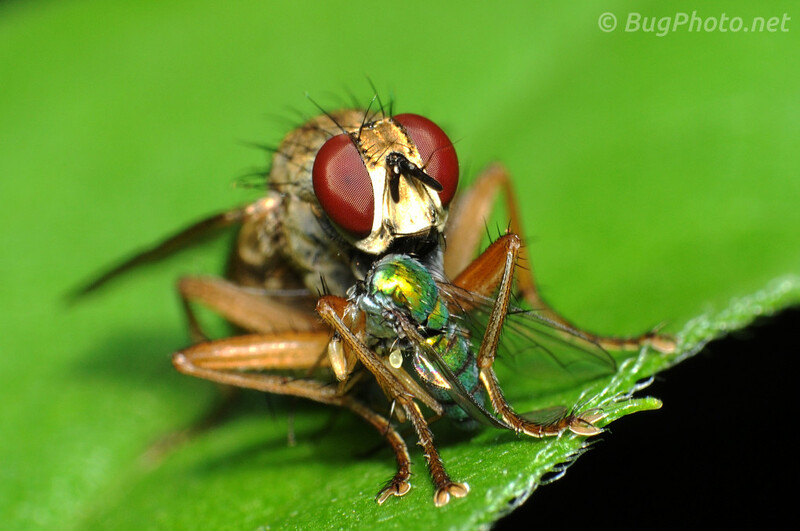 Posted in DipteraTagged dinner, dung fly, fly, letting go, my precious, predator and preyBookmark the permalink.